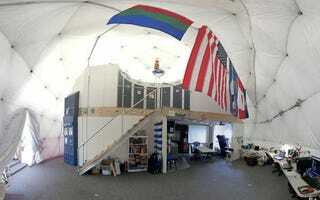 One year ago, six volunteers—an astrobiologist, a physicist, a pilot, an architect, a journalist, and a soil scientist — entered a 36-by-20 foot dome, located near a barren volcano in Hawaii, to simulate what living conditions would be like on Mars. Today they re-emerged from their year-long isolation. The NASA-funded project is called HI-SEAS (Hawaii Space Exploration Analog and Simulation), designed to test the effects of isolation in confined conditions of a human mission to Mars. This is the third such simulation, and the longest; the two prior missions lasted for four and eight months, respectively. The Mauna Loa volcano in Hawaii was chosen as a location because it’s most similar to the red, barren Martian terrain. The six participants could only communicate with the outside world via email, and those transmissions were delayed by 20 minutes to mimic how long it would take for such a signal to travel between Earth and Mars. Resources were limited: anything they needed, they had to bring into the dome with them at the outset, right down to duct tape. Food was replenished every four months, and water every two months. The crew were allowed to leave the dome, but only if they donned heavy space suits. And there were simulated emergencies: everything from power outages and broken tools, to a forced evacuation to avoid a harsh radiation wave. The two women were there when the crew entered the dome last year, snagging exclusive interviews and a peek inside the dome itself before the members went into isolation. And they left the crew with their own cameras so they could film themselves going about their daily life. “We would give them a shot list [via email] and they uploaded the footage throughout the year,” DeFilippo told Gizmodo. DeFilippo and Gorringe met as graduate film students at Stanford University, and something about Silicon Valley’s fascination with futurism and technology rubbed off. “We realized the stuff sci-fi dreams are made of was becoming reality, and we kept wondering, what would be actually be like to live on Mars?” said DeFilippo. When they heard about the HI-SEAS program, they immediately wanted to be part of it. And the Red Heaven documentary project was born. Now the filmmakers will be doing follow-up interviews and hopefully following each member as they re-acclimate to life in their hometowns. Then they’ll head into post-production on Red Heaven, processing the hundreds of hours of footage they’ve collected, with a projected release date of 2018. All of that will cost money, of course. So DeFilippo and Gorringe have launched a Kickstarter campaign to raise funds for the final phase of their documentary project. So far they’ve racked up over $23,000 of their $40,000 goal, with 23 days left to go in the campaign. As for NASA, its researchers will now begin the laborious process of analyzing and comparing data from the three HI-SEAS simulation missions, focusing on the psychological effects of isolation on the crew members. There will two more HI-SEAS missions under the dome, starting in January 2017. 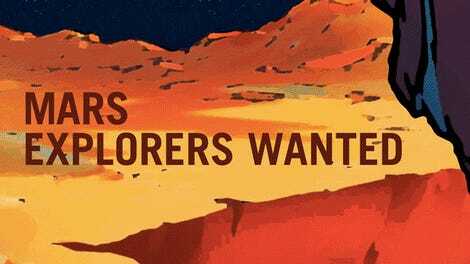 NASA’s goal is to send humans to Mars by 2030. An earlier version of this post included a photo of crew members from a prior HI-SEAS simulation. It has been updated with a new photograph of the current crew.